Flow meters are an important part of many fluid handling systems. They provide feedback on the rate or total volume of fluid that has moved past the sensor. We offer several different types of products to fit your requirements. Small, chemical-resistant variable-area flow meters provide a visual indication of flow rate. Electronic sensors provide electronic output signals (and digital display in some models) for integration with data loggers or system controls providing a higher level of system control. Don't forget your Flow Accessories! FM80 Direct Reading Flow meters  Larger rotameters with MPT threads for larger flow rates (liquids up to 18 LPM; air up to 12 SCFM). 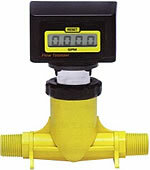 FM80PL Plastic Direct Reading Flowmeters - Larger rotameters with all plastic construction. Flow rates up to 20 LPM. FD200 Digital Flow meters  Electronic battery-operated paddle-wheel flow meters adapt easily to many process applications. Digital display of Flow rate or Total. Flow rates up to 200 LPM. Digital output signal transmits up to 1 mile. FD201 Digital Flow Controller New!  These paddlewheel flowmeters are factory calibrated with the engineering units that you require. The precise digital technology in the sensor is used to accurately monitor flow rates from 1.0 to 20 ft/sec. Non-volatile memory, weather resistant ABS housing, and corrosion-resistant construction. Bookmark this page and come back later for more Flow Measurement solutions.